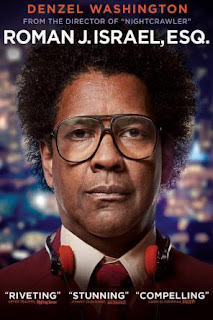 The legendary Denzel Washington is quite convincing as well as moving, here, as a beleaguered soul afflicted with Asperberger's syndrome. And the Academy does have a history of rewarding thespians playing impaired characters, including Eddie Redmayne (2014) for wheelchair-bound Stephen Hawking (ALS); Colin Firth (2010) for stuttering King George VI; Geoffrey Rush (1996) for mentally-ill David Helfgott; Tom Hanks (1994) for dimwitted Forest Gump; Tom Hanks (1993) for AIDS patient Andrew Beckett; Daniel Day-Lewis (1989) for cerebral palsy victim Christy Brown; and Dustin Hoffman (1988) for mathematics savant Rain Man. Win, lose or draw, Denzel deserves accolades aplenty for his powerful, Oscar-nominated performance. DVD Extras: 8 deleted scenes; Denzel Washington: Becoming Roman; The Making of Roman J. Israel, Esq. ; and Colin Farrell: Discovering George.